I was however willing to compromise with an easy way to tune and started investigating the use of L Network matching units, largely spurred on by the books, videos and website of well known Australian portable operator Peter VK3YE and was just about to make one, when I came across a blog post by VK3IL on an EFHW Matching Unit. The unit is effectively a 1:64 transformer wound on a toroid, with the idea being it will bring high impedances down towards a closer match to 50 ohms, with a capacitor used to electrically shorten the Antenna at the higher frequencies. With most of the components sitting in my workshop, I assembled the matching unit per the pictures and documentation, but notably I did not have a FT-140-43 toroid so used a Jaycar LO1238 L15 toroid instead – we’ll get to this later. Tuning either side of this made an insignificant amount of difference to the impedance, which is what I would expect given the 1:64 transformer. It looks like I suddenly have a no-tune QRP antenna! So far I have taken the the antenna half way up Mount Direction as part of a failed SOTA activation (The track I was following was not the proper track and petered out to bush bashing a steep and slippery slope, which was asking for trouble! ), where I discovered that I had made a cold solder joint which caused SWR to be too high to safely transmit. Second attempt was much closer to home by climbing Natone Hill. Here I was thrilled to work JH1CDR on 14.215Mhz with a Rx 4/1 and Tx 5/9 signal report, running 5 watts. 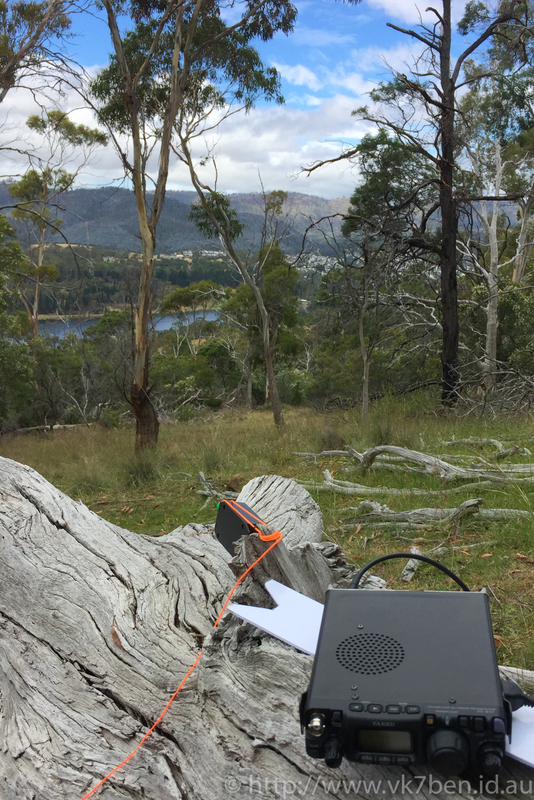 QRP with EFHW on Mt Rumney. Click on Image to Enlarge. What was surprising about these contacts though were that due to me hitting a button on my radio at some point, they were made using only 0.5W and not the 5W I thought I was using. I was particularly pleased about these reports based on this revelation. Your coax to the matching box should be long enough to comfortably sit or stand a metre or so away from the antenna. This allows you to better position your EFHW, along with making it more comfortable to operate. A corollary from the last point is to make sure you have a tent peg or two with you to tie he matching unit to if no tree available. Owen has written quite a few technical articles around EFHWs and I have linked to them below (including one based on my correspondence here). I can now see why the EFHW has quite a following with portable QRP operators. It seems a relatively capable antenna and with the use of a matching unit or unun becomes a multiband “no-tune” antenna. Operationally, considerations must be made for placement of the antenna, particularly the securing of the matching unit to a nearby fastening, to ensure ease of operation and strain on coaxial feedline. 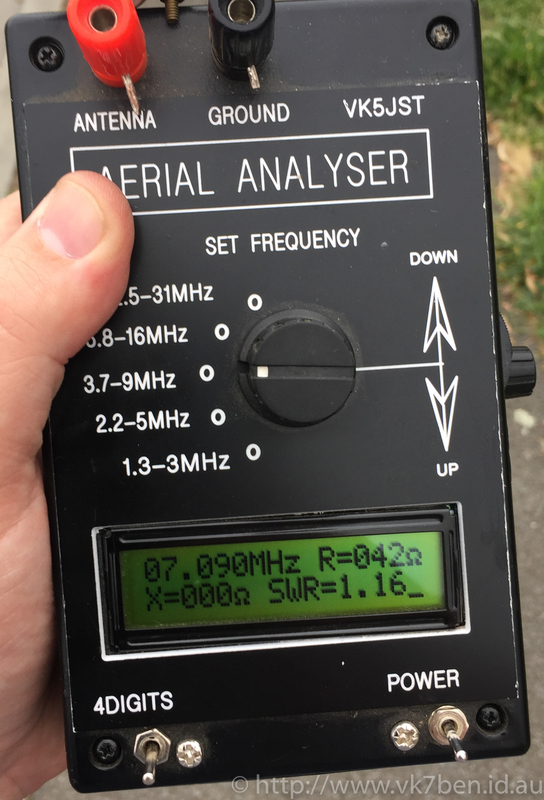 This antenna with it’s modest performance and ease of construction is definitely worth having in any portable QRP station kitbag. Theres a lot of useful information I found online while researching and building my EFHW Antenna. I have included some of those articles below.